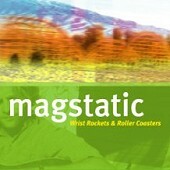 "Wrist Rockets & Roller Coasters" is the sophomore full length by MAGSTATIC and it finds the band speeding it up, stripping it down and kicking it out. The members of the band have their roots in vibrant punk rock and on this album it is that influence that takes center stage. Certainly punk has always been an element of the MAGSTATIC sound but on "Wrist Rockets & Roller Coasters" it becomes the focal point. They still have an abundance of quirky pop hooks, unlimited pathos and brilliant songwriting, so fans of the "emo factor" in their music need not worry (just listen to the tunes "Heaven" "Dirt" or "Army" for example), it is simply that they have distilled the vibe into something with more urgency and a sharper edge. The CD kicks off like a bat out of hell with "Wrist Rocket" which will have fans of the seminal pre-MAGSTATIC band THE STENCH licking their chops. If THE STENCH hadn't met with an untimely demise this is exactly what they would sound like in the year 2001. Track 2 "Promise" throws fuel on the fire with more pinpoint punk and is my current favorite on the album. It is a re-recorded version of the tune that appeared on the Guapo label sampler. The band downshifts on track 4 "Crazy" tapping into the emotional vibe that is their calling card while still branching out with some horn embellishments (no, not ska... good horns). "Roller Coaster" is next and is a stellar example of Terrence DH's lyrical prowess. The aforementioned trio of tracks "Heaven", "Dirt" and "Army" are next and each one is classic MAGSTATIC... teeming with melody, emotion and beauty. "Like Cursive", "Ghost" and "Go Die" follow showing the band's masterful combination of snap and gentleness. "Girl" and "Comeback" top off the album and both are totally frivolous and fun songs. "Girl" is a nod to 80s new wave with funny as hell lyrics. "Comeback" is a KRAFTWERK flavored synth thing and cracks me up as well. This CD is a must whether you consider yourself a fan of pop, punk, emo or just great rock 'n' roll. After all "These are the things that this life's made of..."